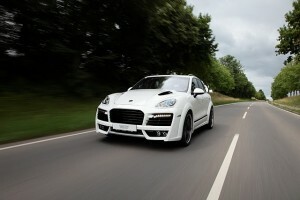 Porsche tuner Techart has come up with a new upgrade kit for the Porsche Cayenne Diesel which makes it more refined, gives it more power, and a distinctive sound. The intelligent engine management – TECHTRONIC – increases the performance of the SUV from 176 kW (240 hp) up to 206 kW (280 hp). Furthermore the new EC-certified TECHART sport exhaust system provides the car with an impressive sound. What’s good about this system is quick and easy installation. Plus it’s invisible to Porsche dealers and won’t mess up your maintenance and service schedule. The diesel Cayenne also sound magnificent thanks to the kit and also because of the TECHART exhaust twin tailpipes with embossed TECHART logotype.